Another harvest is in the books across most of Western Canada and the winter marketing season is just getting underway. Organic prices were steady to higher for most of the major crops in October, with attention now focused on determining the quality of what came off the fields. “A lot is being tested, and growers are finding out for the first time if (their crops) will be for human consumption or for feed,” said Austin McGhee, of CB Constantini in British Columbia. 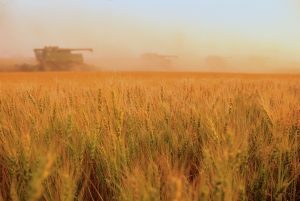 He said supplies of higher protein wheat were relatively tight, with very large supplies of lower protein wheat available – especially from the U.S.
McGhee said some good quality, but lower protein milling wheat might make its way into feed channels this year if growers are facing any cash flow needs. Jeff Page, a merchandise with Rein Agri Food Group in Saskatchewan, said some 14 and 15 per cent spring wheat was still being found, but not at any great volumes, which was causing price spreads to widen. “Demand will outweigh supply this year, which is driving the price up,” said Page. He added that “it’s a producer’s market” and farmers will benefit more than usual. However, while price opportunities may present themselves, production was hit-and-miss across the Prairies and for every farmer with product to sell, there are also those who dealt with drought and had poor production. Looking at the pulse crops, lentils haven’t moved up as much as they could, and should see some strength by January, according to Page. He said peas were firm, with the good quality limiting the availability of feed peas. A number of new pea plants are in the works across the Prairies, and Page expected peas would be a market to watch in upcoming years. The Asian market for pea protein is also expanding, with new plants in the works there presenting additional demand streams for Canadian exports. “I’d be surprised if we oversupply, if anything it will be undersupplied, at least for a couple of years,” said Page on yellow peas. “The quality of the crop was fantastic, and yields were average to above average,” said Scott Shiels, of Grain Millers in Saskatchewan on the oats crop. He said the large crop wasn’t yet pressuring prices lower, but was keeping a lid on the upside. “It looks like supply will be more than adequate for the year,” said Shiels. The earliest harvested supplies had seen light test weights – but after the first week, “we saw nothing but really heavy, really good quality coming off,” which Shiels described as surprising given the amount of rain. The subsoil moisture was good during the growing season, but that’s all depleted now and there won’t be anything left in southern Saskatchewan without late fall rains and a good snow cover. “They sucked it all up and made for a pretty good crop,” said Shiels. Looking ahead to 2018, rotation is especially important for organic producers as they need to manage fertility more than conventional growers. “One thing we’ll see a lot more of in the next few years is peas in the rotation with oats,” said Shiels adding that “the pea/oat rotation is a really good one for productivity.” However, he added that one problem is that there is zero tolerance for peas when selling oats for milling, which will hopefully be worked out through better cleaning methods. “It’s great nutritionally for the soil (peas and oats in the same rotation),” said Shiels adding that the fact that there are new markets opening up for peas makes it even better for the grower, as they won’t be just growing peas as a plow-down green manure.